Cowboy poet Tom Swearingen tells stories about the American west based on his life in the saddle. Funny or serious, he brings his original stories to life with the rhythm of poetry. Tom is popular at cowboy gatherings and horse camps. But he is also popular at libraries, historical centers, and wherever else you find folks who appreciate the cultural heritage of the West. 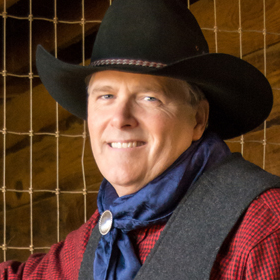 Tom is two-time winner of the National Finals Rodeo Cowboy Poetry Week Contest. His Horses and Happiness CD is a two-time Western Music Association finalist for Cowboy Poetry CD of the Year. Tom and his wife live in Tualatin, Oregon and can often be found riding horses in Oregon’s backcountry. Here is a video of Tom performing "When a Horse Hoof Hits the Ground."